All scripture is God-breathed and is profitable for teaching, rebuking, correcting and training in righteousness. Past history recorded in the Bible, gives encouragement and provides edification. Present application of God’s Word, enable us to live a godly life in Christ Jesus. Future prophecies in Scripture, secures our hope in Christ and develops our faith. All Scripture is written FOR us but not all Scripture is written TOWARDs us, which is why we must correctly handle the truth contained in the Bible.. why we must accurately explain all that is contained in God’s Word – why we must and rightly divide the word of truth. All Scripture is inspired by God and is useful to teach us what is true and to make us realise what is wrong in our lives. It corrects us when we are wrong and teaches us to do what is right. How important to rightly divide the Word if we are to understand the God’s plan. 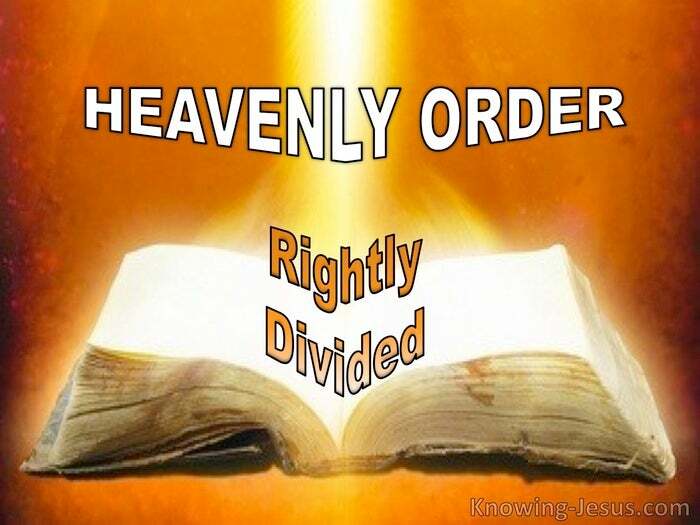 We must rightly divide the Word of God:- to understand our heavenly future and Israel’s earthly inheritance.. to understand the gospel of the kingdom, and the gospel of the grace of God – to understand the old creations in Adam and Jacob and the new creation in Christ. And we must rightly divide the Word of God.. to understand Satan’s current rule – and the millennial reign of Christ. The old testament tells why the created world is under the control of a rebellious angel. Satan rules earth from a heavenly realm through various human counterparts. The new testament presents the same heavenly order of the devil’s demonic ploys, and the spiritual battle of the age is raging against Satan’s heavenly realm – an unseen war, where wicked powers rule gentile nations from high places. But deeper revelation of this heavenly realm is given to us through Paul.. a heavenly kingdom rejected by Israel at the first advent of Christ.. a heavenly rule that was taken from Israel and given to another nation – a nation that would bring forth the fruit thereof…. the new creation in Christ. Christian believers are citizens of heaven and residents of the heavenly Jerusalem, and we eagerly await our Saviour from heaven – the Lord Jesus Christ. Christians have been saved with a view to realising this heavenly inheritance – a heritage and position that is currently being occupied by satanic usurpers. In Christ we are seated in heavenly places, but satanic rule trespasses our position. The work of God’s Spirit throughout this present age has this spiritual focus:- redeemed man.. prepared by the Spirit to bring forth the fruit He requires; saved Jews and Gentiles, participating in a spiritual battle and heavenly war.. a bride for Christ, prepared as co-regent with Him in His heavenly kingdom – the one new man in Christ – the Church. And the one new man in Christ, is seven times exhorted to overcome in the spiritual war, for overcoming is God’s will for all believers. We are to overcome the world. 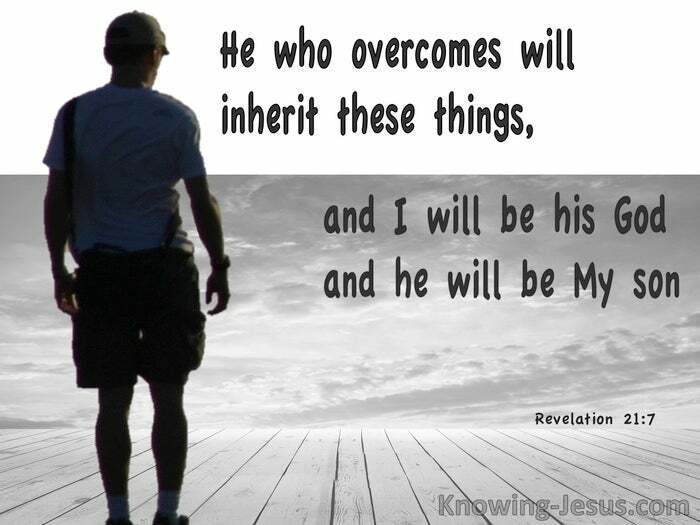 We are to overcome the flesh and we are to overcome the devil.